What’s involved in learning to fly hang gliders at Rohan’s School? To get to the skill level where you can fly around for hours in a hang glider like you may have seen some friends or other pilots do, you are required by law to undergo training at a HGFA approved facility. We are here to teach you the practical and theory aspects of the sport to the standards set down by the HGFA. This is the HGFA Supervised Pilot Certificate. Pilot certificate courses are conducted over 9 consecutive days. We conduct Pilot Certificate training this way to make the course more affordable for the trainee. 9 consecutive days allows us to provide continuity in your training with minimal interruptions for travel and other distractions. Accommodation is provided on-site to further facilitate making use of every available hour during the course and minimising your time and money outlay. Gaining a pilot’s certificate can be serious stuff, but it is a lot easier to learn than you might think and with the right attitude a lot of fun! 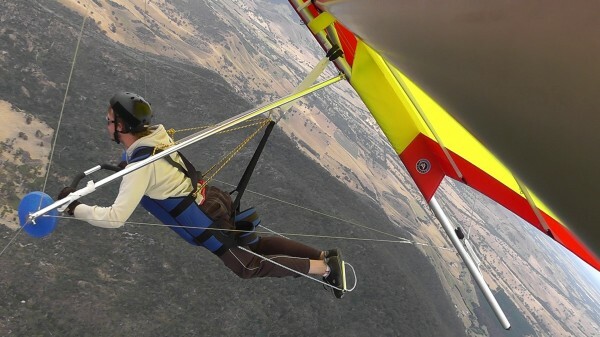 It may help to know that hang gliding is currently five times safer than paragliding or riding a motorbike on the road. In order to undertake training to gain your Certificate we will require that you have become a member of the HGFA, have achieved approximately 2 hours of airtime by way of Tandem Instructional Flights in a tandem hang glider or microlight whereby you have learned the skills of pitch and roll control. This tandem airtime must be logged and signed off by a HGFA/RA Aus tandem rated pilot, and can be done at various facilities around the country (see below for full list). Hang Gliding for Beginner Pilots by Peter Cheney (available here upon booking). HGFA Operations Manual (available online at www.hgfa.asn.au). 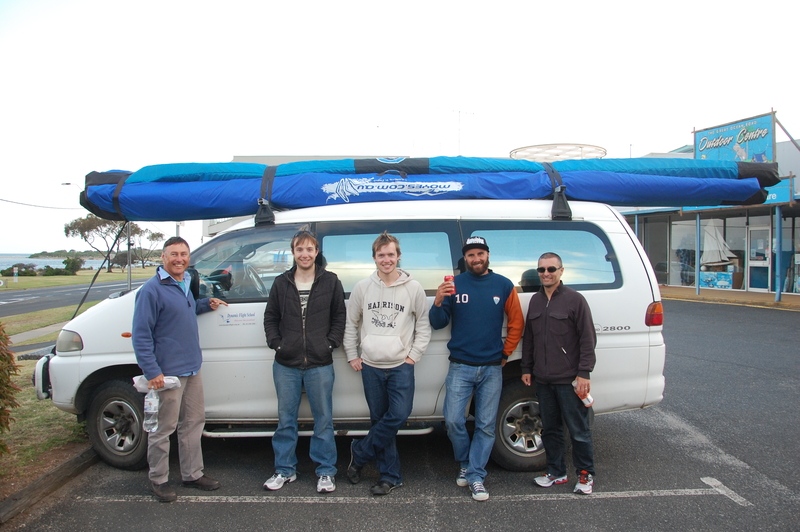 HGFA Pilot Training Workbook – Hang Gliding (available online at www.hgfa.asn.au). These pre-requisites will enable us to take you to our grassy training slopes which are long and free of obstructions to practice your take offs and landings with maximum safety. Altitude increases out of the instructors reach will be granted only after you display the competence and confidence necessary. After multiple flights from higher hills with the demonstration of good flight skills and planning we will progress to gain further airtime launching from nearby hills/mountains in a little more breeze with the aim of ridge soaring. Classroom theory lessons are incorporated into each day of the course. These theory lessons prepare you for each days flying and the theory exam that is undertaken near the end of the course to complete the requirements to gain your certificate. Your days tuition commences at 9am each morning (unless otherwise advised) and often conclude around sunset each evening. Gliders are provided on the course, these are maintained to the strict training facility maintenance requirements. These gliders are available for purchase towards the end of the course so you are able to continue growing your skills directly after leaving this training facility. Accommodation and a continental breakfast is provided for the duration of the course. There is an IGA in Beaufort to stock up on supplies as well as a Safeway (Woolworths) in Ararat and Ballarat. The kitchen area has a fridge, freezer, kettle, toaster, BBQ hotplate with gas stove and a microwave. There are pub meals available from the Beaufort Hotel which is a small 5 minute drive from the school. To maximize flying time, the course is limited to five people at a time. To learn how to fly, you must be over the age of 15 and meet the same health standards you would need to drive a car. When travelling to this area you will find that a Telstra phone service/plan is most effective. The common room has a fireplace and DVD player with stacks of hang gliding DVDs. Plenty of after hours entertainment! Please see our website calendar for full date details. A deposit of $1,450 secures your place on a course – we then express post the Peter Cheney book to you. A further $2000 must be paid before the third day of the course. The rest can be paid at the start of the course. Please note: Prices are subject to change without further notice, no cash refunds are given on our courses or deposits, although credits can be carried over for a maximum of 12 months. Please fill in the form here to reserve a spot in one of the courses. DAY ONE & TWO commence at 9am sharp viewing instructional videos, followed by a theory lesson. The rest of your day, usually until late, will be spent outdoors, handling the glider on the training slopes, achieving short flights where you will be a few feet above the ground with the instructor by your side. The second day is when you may test your fitness levels. By the end of this day, if the conditions and skills permit, flights of over 100 metres long can be achieved, flying free of the instructors hand while receiving verbal guidance via your instructor running beside you. Now that’s really flying! The training hill teaches you how to handle, launch and land the hang glider. DAY THREE, FOUR & FIVE start with some more theory followed by glides from the top to the bottom of a slightly larger hill. Here you need to demonstrate the competence and confidence to fly the glider with only verbal (radio) assistance from the Instructor. The flight skills and planning you learn over these days are the foundation skills for your higher flights in the days to come. DAY SIX & SEVEN Pilots will be demonstrating accurate landing zone approaches and landings. Glides from higher hills will allow us to perform left and right 360º turns. Some more competent & confident pilots may have sufficient skills to work the lift zones and achieve soaring flights. Weather depending, pilots will have sat and passed their theory exams by day six or seven. DAY EIGHT & NINE will see you soaring the skies like a bird of prey with the Instructor again guiding you throughout your exhilarating flight with radio communication but maybe less feed-back now, in which certain skills should be displayed to fulfil the requirements of the HGFA. As you gain further experience your flights should also increase in duration. You should be soaring with minimal input from the instructor, although he will be close by to give advice to fine-tune your techniques should you require it. By the end of these nine days most students should have consolidated their skills which will ensure that the standards for issue of a supervised pilot certificate, as set by the Hang Gliding Federation of Australia (HGFA), have been met. When you have received your supervised pilot certificate this will allow you to spread your wings outside of school supervision, however we encourage new pilots to join the local Hang Gliding Club where you can receive advice and assistance from other pilots, and be part of a the local flying group.